That’s the question asked of marketers in a recent survey. And for anyone who watches the industry, it’s probably no surprise that the majority of respondents said yes. The survey, conducted by ad-tech firm Viant and reported on in eMarketer, clearly suggests that marketers are concerned about the efficacy of their ad placements and their ability to attract customers. 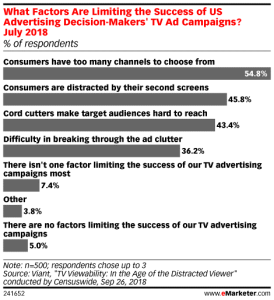 Between second screens and cord-cutters (and even cord-nevers), TV advertising appears to be in real trouble. That’s why we’re seeing marketers shift budgets from TV to digital. However, TV is not dead. Far from it. As one commentator pointed out recently, people spend nearly five hours/day watching TV (including through OTT services), but only 45 minutes on social media and 25 minutes on mobile video. In fact, the amount of time watching TV is only continuing to grow. Thus, while marketers might be able more accurately target audiences on digital, they are increasingly competing for a much smaller window of opportunity to capture a viewer’s attention. So what can marketers do to ensure their media buys have impact, be they on television, digital, or other channels? 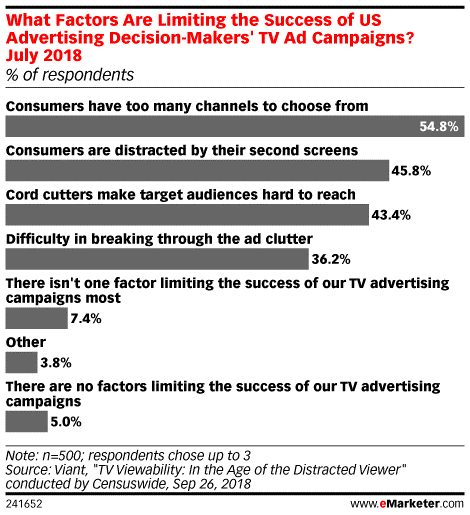 How can marketers cut through not only the clutter (a popular advertising saying that, frankly, needs to die) but also cut through the distractions? Part of the answer to these questions is having a well-balanced approach to media buying, focusing on the channels that work well in conjunction. It also is a call for a more holistic ad buying platforms, where marketers can see which channels are contributing to conversions, even when they don’t lead to conversions directly. And that means better data collection and analysis, something we here at Capital Media preach quite frequently. In other words, an effective media buy isn’t only about any particular channels, but whether or not those channels work together to create a more effective whole. If you need help evaluating whether your media mix is working, contact us. We’ll analyzing what you’re doing to identify what’s working, what isn’t, and what can be improved.